Ah, the Nineties, when men are men and women smoke cigars, where a neat 21-year old single malt scotch is at home with a rare 42-ounce prime aged porterhouse steak and the Yankee game on the television over the bar is as much a tradition as the tune of “Route 66” emanating from the baby grand in the jazz lounge downstairs. 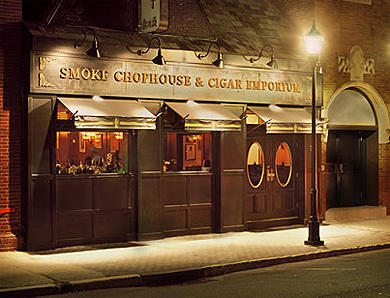 Enter the 60-seat world of Smoke Chophouse & Cigar Emporium in Englewood. As the name implies, it’s a restaurant that encourages smoking, and while the state-of-the-art ventilation system changed the air six times an hour, guests are still saturated with the lingering odor of cigars.